When a famed Oxford historian is found dead in his study one night, all evidence points to his son, Stephen. About to be disinherited from the family fortune, Stephen returns to home after a long estrangement—and it happens to be the night his father is shot to death. When his fingerprints are found on the murder weapon, Stephen’s guilt seems undeniable. But there were five other people in the manor house at the time, and as their stories slowly emerge—along with the revelation that the deceased man was involved in a deadly hunt for a priceless relic in Northern France at the end of World War II—the race is on to save Stephen from a death sentence. Everyone has a motive, and no one is telling the truth. Unwilling to sit by and watch the biased judge condemn Stephen to death, an ageing police inspector decides to travel from England to France to find out what really happened in that small French village in 1945—and what artifact could be so valuable it would be worth killing for. ©2010 Simon Tolkien (P)2010 Brilliance Audio, Inc. If you are looking for an action-packed thriller, you will probably want to bypass "The Inheritance." 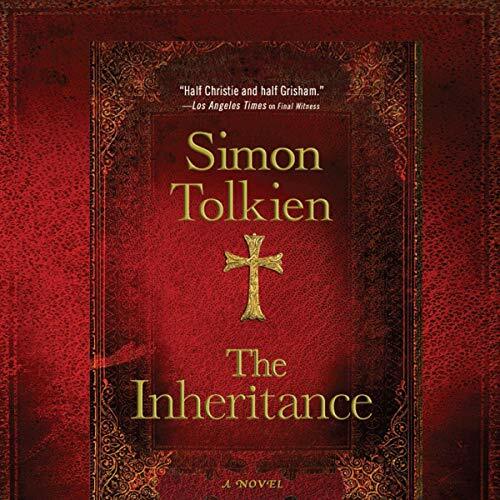 On the other hand, if you like an intriguing cerebral mystery -- with a large helping of courtroom drama -- you may enjoy Simon Tolkien's offerings. "The Inheritance" does, indeed, proceed slowly, exposing its mystery bit-by-bit, the way a mystery in real life would reluctantly unfold to the relentless picking of a determined mind. Tolkien gives us an unwilling protagonist in Inspector Trave, who wrongly arrested the seemingly obvious murder suspect, then begins to realize his mistake. Police departments frown on their inspectors siding with the defense; but Trave now feels obligated to save the innocent -- but convicted -- young Stephen Cade from the death penalty. A good portion of the story follows the trial that ends up convicting Cade for a murder he didn't commit. This trial takes place in 1959, when, according to contemporary British law, executions were carried out soon after the convictions. This puts Inspector Trave under tremendous time pressure to unearth the truth of the murder. But we don't see very much typical legal thriller action. Rather, Trave must patiently track down the meager clues that he can find -- the ones that some of the other characters want very much to keep from him. As he relentlessly pursues these clues, he begins unearthing a tightly-guarded secret and a deeply-buried treasure. "The Inheritance" definitely rewards the attentive listener's time. I have only one minor objection to this audiobook, relating to the author reading his own work. Although Simon Tolkien has a beautiful voice, with a classy, upper-crust British accent; he doesn't have the acting chops needed to vocally distinguish his characters. Sometimes the listener has a little difficulty knowing which character is speaking. Good actors can add a lot of pleasure to an audiobook with a skilled performance. Otherwise, I highly recommend this audiobook. This is a very disappointing book, plodding, slackly plotted, wooden characters. Simon Tolkien has not inherited his grandfather's abilities, but even considered on its own merits, his work is merely mediocre. Would you consider the audio edition of The Inheritance to be better than the print version? I didn't read the printed version. What was one of the most memorable moments of The Inheritance? Moment when Mary revealed the actual hiding place of the cross to Sasha. Have you listened to any of Simon Tolkien’s other performances before? How does this one compare?